Just like LP Recorder and LP Ripper, LP Burner is designed to do just one thing and do it well: make audio CDs from stereo WAV files. Most general purpose CD / DVD burning programs are designed to handle dozens of different file formats, CDs, DVDs, Blu-ray disks etc. etc. That might sound good at first but the end result is often over-complicated and difficult to use. If all you need to do is make audio CDs to play on standard stereo equipment, from WAV files you have created with LP Recorder and LP Ripper, then LP Burner was developed just for you. Use LP Recorder to record both sides of your LP or tape to a single CD-quality WAV file onto your hard disk. Select Split Tracks from the LP Recorder menu to launch LP Ripper to split the large WAV file into a separate WAV file for each track. 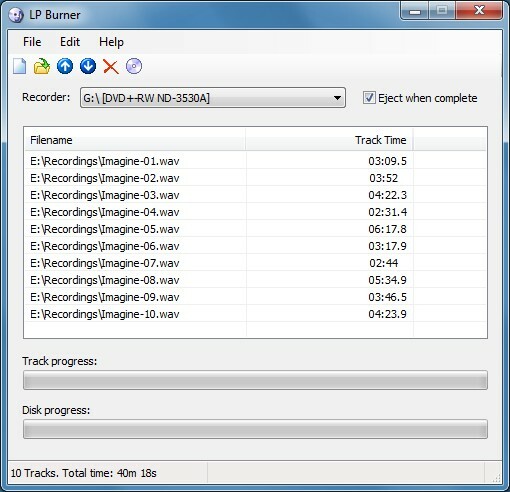 Select Burn Tracks from the LP Ripper menu to launch LP Burner to copy the resulting track WAV files to a blank CD-R disk. Refer to the Quickstart Guide supplied with each program for more detailed step-by-step instructions. If you are using other recording or track-splitting software - no problem. If the audio recordings originated from tapes, cassettes, radio, TV, DVD, VCR, the Internet etc. - no problem. As long as the recordings are standard CD-quality* WAV files then LP Burner can create audio CDs from those files as well. Download the trial copy of LP Burner to make sure it works well on your system. It includes all features of the registered full version for you to use for an unlimited time except that only the first two tracks listed are actually copied to the CD.